The ploughed field led to Crowfield church and the going was much easier and prettier! Dudley spots a rabbit in a nearby field... years of training to chase small furries for racing can take a long time to un-learn! Dudley's first visit to the marina. Cassie was still out of the water for the winter, but at least he got to see her, even if he couldn't get on board. The marina was flooded after the heavy snow a week or so earlier. Dudley takes going to work in his stride. He often comes with us when we are busy and have to work evenings and weekends. Think he's just happy to be with us. This was Dudley's very first greyhound walk in Clacton and he and Jet are getting acquainted. The local Greyhoundhomer branch organises these walks every couple of months and there can be anything up to 50 or so greyhounds and their owners meeting up, sometimes more. The wonderful thing is the dogs all get along beautifully and have a wonderful time. Don't think Dudley had ever seen the sea before. Think he would have dearly loved to have been off lead like a lot of the others, but we haven't had him long enough to consider letting him off yet. Weather was overcast, but mild. Not bad for early March. Every now and then the walk comes to halt to allow the stragglers to catch up. The brindle dog with the red coat with gold trim in the middle of the picture was from the rehoming kennels and looking for a home. It gives anyone interested the chance to 'test-drive' a grey for a while. ...then the owners get the treat of visiting the nearby hostelry! 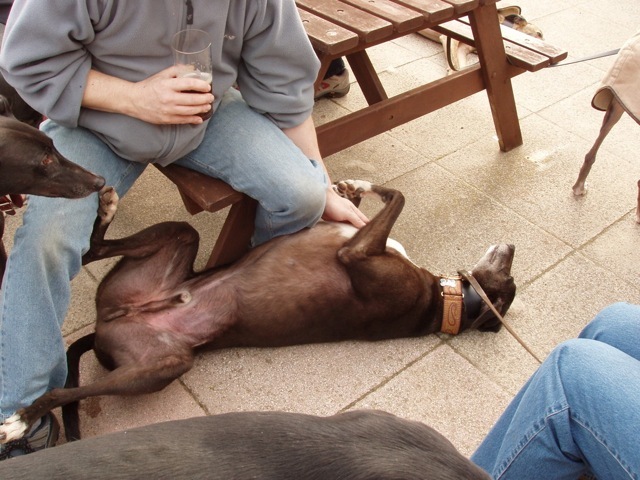 We think that Dudley looks a little TOO comfortable and at home in the pub garden! What you doing down there then dad?